I think the explosion of TensorFlow, Keras and so forth on Python, is probably what caused these to fall by the wayside. h2o driverless AI looks fascinating... if you could throw data prepped in Alteryx at a driverless AI system, that would be a very powerful solution. They just announced the partnership yesterday. 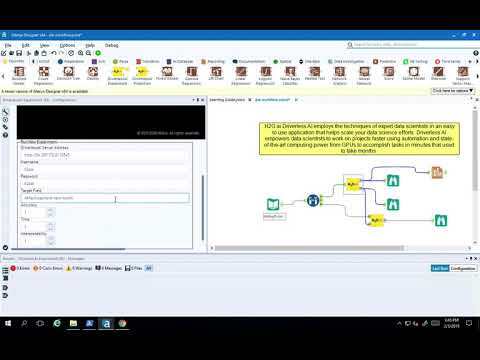 Driverless AI customers will now have an integration option so they can run DAI models on their alteryx data from within alteryx. Uploaded by H2O.ai on 2019-02-05. That's great stuff. Elastic compute probably is the best direction for any enterprise scale machine learning, and that little demo ties it right in with Alteryx. Very cool. Check out ludwig, a driverless deep learning solution recently open-sourced by Uber. It uses tensorflow and is based on python. So... with the right python/tensorflow installation in place, (tricky but a one-time affair) you could probably build an analytic app to create a deep neural net by, literally, having the user pick a dataset, check the target, check/uncheck predictors, apply some range limits if necessary... and off it goes: user builds a deep learning model without knowing anything at all about deep learning. You could probably build a shap explainer into the same app and provide that as output along with the trained model; still without the user knowing anything other than that they can get pretty good predictions along with answers to "why that prediction". KNIME (open source) has done some interesting thinking on Guided Analytics. In particular they have an entire example (requiring enterprise version to run, so no longer open source) of Automated Machine Learning that looks not unlike like Ludwig, except it is ready-to-go as point-and-click from a browser, including ample room for user input; heck Ludwig could even be tied into the back-end as one of the models considered. Very robust. Would love to see something like that in Alteryx. Seems doable.